I notice something. When I had to pick a favorite male character, it wasn’t so easy, and it involved some introspection. I had to feel my way along for a bit before I could decide. But when it comes to a favorite supporting character, it was rather quick and easy, no introspection needed. It’s easy, and I’m picking an entire group of men, because, really, they’re pretty much all the same character with different faces, and they are definitively all supporting cast, striking that balance between being in the background and being at the forefront of things. 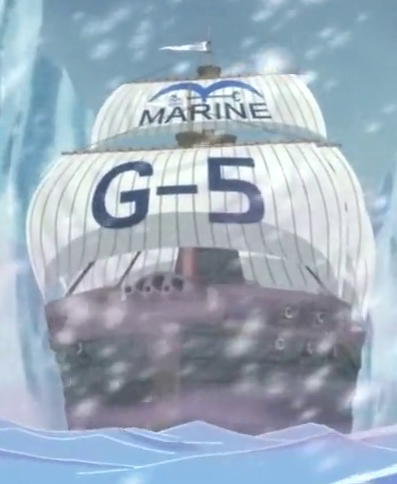 From One Piece, the G-5 Navy Marines! At first glance, the members of Marine Grand Line 5th Branch are… we shall say, not very promising. They’re a bunch of brutish, violent thugs, not much better than the pirates they fight, and fighting is pretty much all they’re good for, in their own eyes and others. Our first introduction to them includes some of the pirates they’ve captured (via beating them down) quaking in terror and babbling about how savage and cruel these criminal marines are. They fear the G-5 Marines as people who’d use pirates for shark bait, or as kindling for a bonfire. A fear which is not entirely without justification. 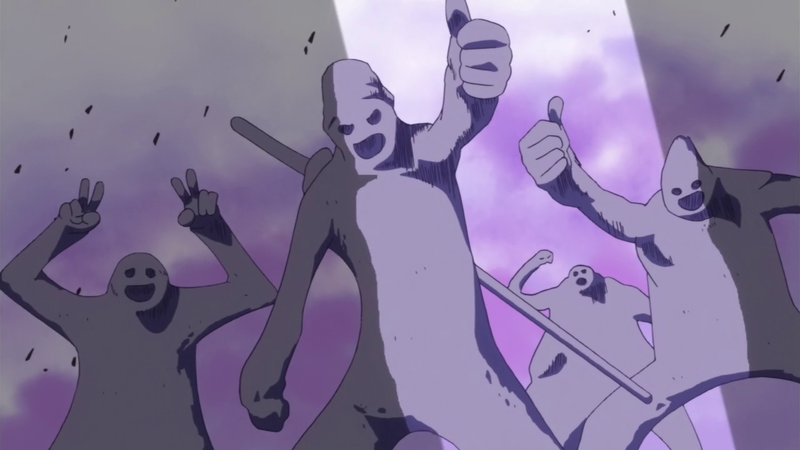 And friends they are, loyal to one another and to their leaders, Smoker and Tashigi. Together, side by side, they face a lot of really weird and dangerous crap. Like having their own ship levitated over their heads, for one single, mild, fleeting example. Still, however loyal they are to one another, it wasn’t until one moment in particular that I started really loving them. We’ve thus far seen the most of them in the fairly recent Punk Hazard arch, and during this arch, the primary antagonist unleashed a potent and lethal gas, intending to use the marines, and everyone else in the vicinity, to prove just how effective it is, by killing them all. 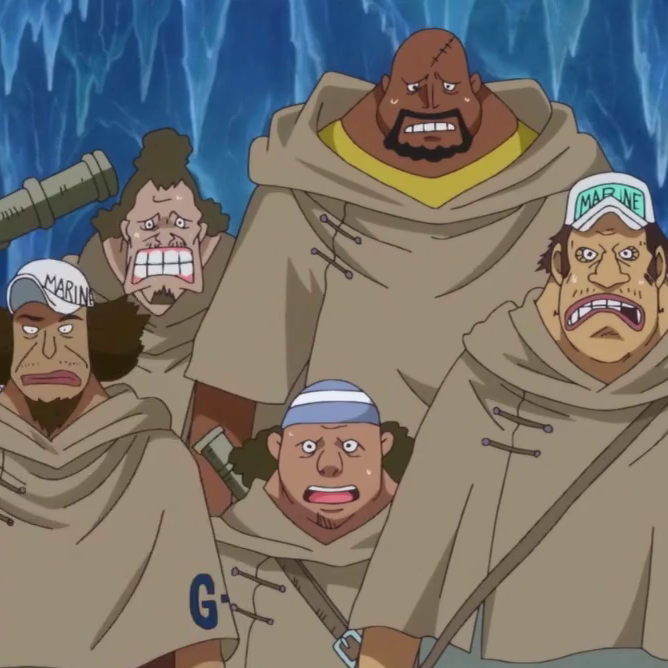 By the time the marines and their unlikely allies, the Straw Hat Pirates, have found safe shelter from this gas, we’ve already learned that it petrifies everything in its path. One touch, and you’re a statue. So, what they do next is inspiring. When the antagonist realizes that some of his intended victims are alive and safe within his fortress, he begins allowing the gas to enter, and everything becomes a pell-mell evacuation from one chamber to the next, and the next, and so on, just trying to outrun the gas and survive. Their captain, Tashigi, absolutely refuses to leave even one man behind, and she’s a little stubborn about it. …but they are every bit as loyal to her as she is to them. She refuses to leave them behind, even as the great, metal gates are sliding shut behind her. So the brutish G-5 Marines simply pick her up, carry her forward, and throw her through the doors to safety. And they’re perfectly cheerful about it! In the very last moment before the gas hits them and they’re petrified, what do they do? They strike poses. Giving “thumbs up” and “peace” signs for their comrades to see as the doors finally slide shut. Any wonder their comrades salute in return? That was the moment I finally pegged the G-5 Marines. They are, basically, a rowdy gang of boneheaded, musclebound meatbrains, with the collective IQ of a teacup, but their hearts are in the right place. 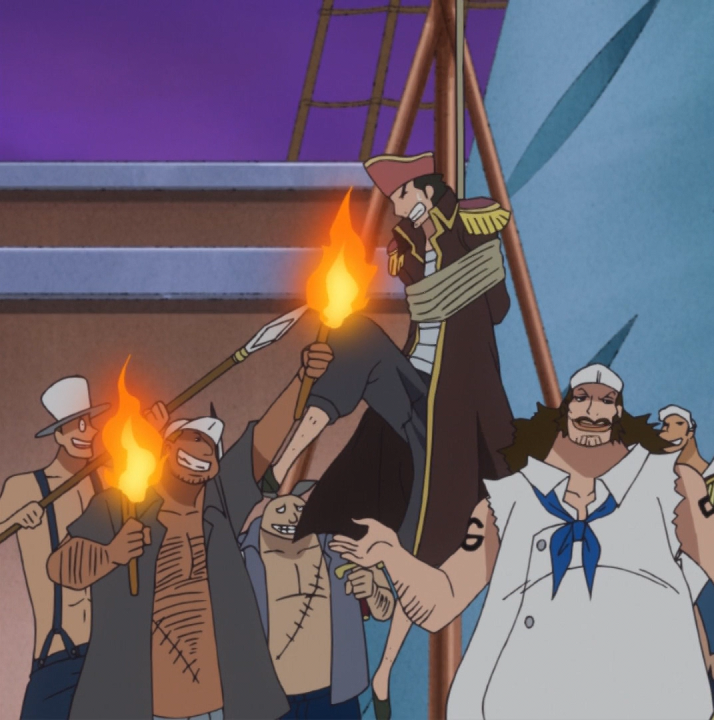 Throughout the rest of their Punk Hazard ordeal, these violent men are faced with the betrayal of someone they looked up to, they go out of their way to help save a number of kidnapped children (which is also an inspiring scene), and they even form an unlikely bond with the Straw Hat Pirates. They clearly see themselves as perfectly good guys, and with some justification to that, so it’s both hilarious and heart-rending as they try to not care about the Straw Hats as friends, as good people. For being the “most violent” of the marines, G-5 also strike me as easily among the most decent. 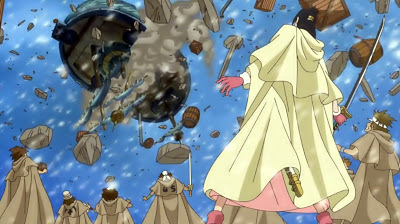 Very few divisions, as a whole, would look past the endless rhetoric and tirades of the government and see the Straw Hats as people, just like themselves. If I were among people like the G-5 for months on end, I’m certain I would be starving for intelligent conversation, but I would still admire, respect, and like them plenty well, for their unique brand of honor, for their loyalty, and for their commitment to their duties. Thus: they are my favorite. Never thought I’d see a Navy ship in One Piece which I would like. 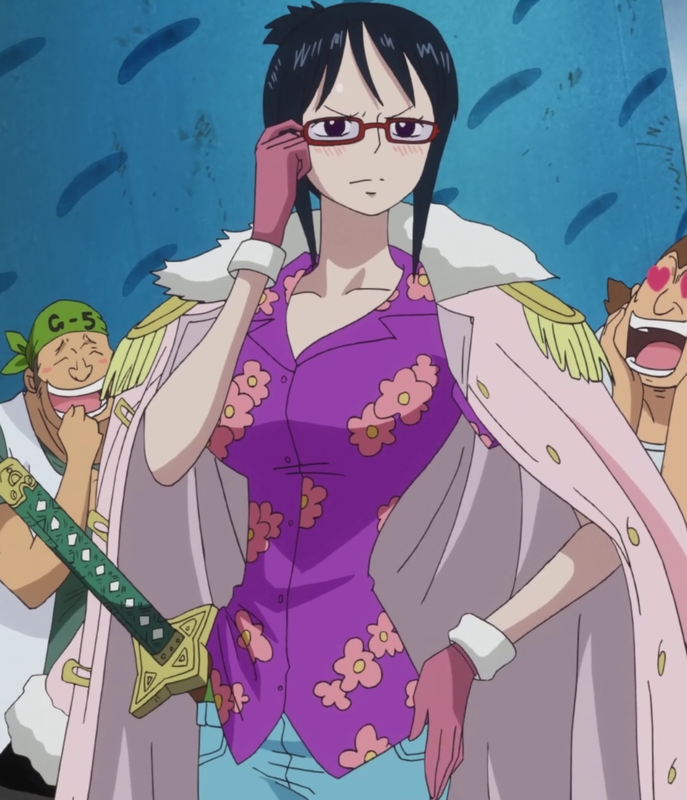 This entry was posted in 30-Day Anime Challenge, Anime and Cartoons, Challenge Accepted and tagged G-5 Marines, One Piece. Bookmark the permalink.